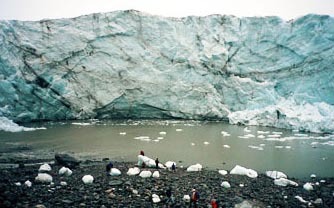 Unusual jet stream circulation caused this exceptional surface ice melt of the Greenland Ice Sheet in summer 2012. Image by Prof. Edward Hanna, Sheffield University. 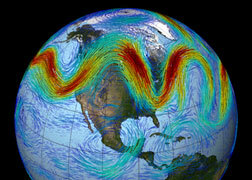 Since 2007, this unusual wavy pattern of the jet stream far north and south, has persisted and brought warm air to Greenland and the Arctic in summer and frigid air in winter to normally mild southern states. Graphic by NASA/GSFC. June 27, 2013 Sheffield, South Yorkshire, England - Back in the 1980s, scientists said the upper safety limit for atmospheric CO2 was 350 parts per million (ppm). But as early as 1988, atmospheric CO2 levels went higher than 350 ppm. So the next safety limit was set at 400 ppm. We're there now! NOAA and the Scripps Institution of Oceanography website, CO2now.org, has a graphic summary of CO2 concentration increases in the Earth's atmosphere since May 2011. Then it was 394.29 parts per million (ppm). The next year in May 2012, it was 396.87 ppm. And then a month ago in May 2013, it was 399.89 ppm and climbing.